You will learn how to use Xorro's Q-Launcher application to start engaging with your audience instantly, and without any preparation at all, from within your existing presentation context. Using Q-Launcher is simple and instant! so this is a perfect way to integrate audience participation into your presentations, lectures and lessons. 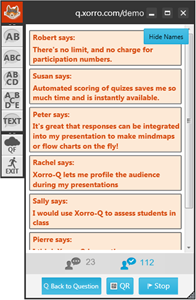 Get Q-Launcher Let's start by logging in to your Facilitator Home Page at http://qf.xorro.com. On the right hand side of the page you'll find the links from which you can download the Q-Launcher (either Windows or Mac OS). Download and install the appropriate version for your computer. (If you cannot install the Q-Launcher onto the computer intended for the session, don't worry: you can also run Q-Launcher without intalling it, either from a USB flash drive or from a folder on your network. Alternatively you can you session using the QF site, but will need to have the browser open to do so. 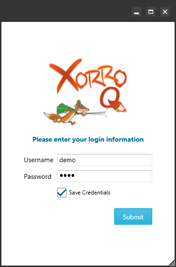 The same applies if you want to facilitate a Xorro session from your Android or iOS mobile device. In these cases, jump to the explanation at foot of this message). 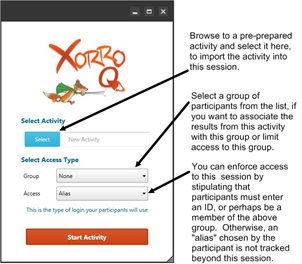 Before class... Double-click the Q-Launcher desktop icon (the Xorro fox), and wait a few moments while Xorro gets organised... Then, login to Xorro using your Facilitator credentials (1). 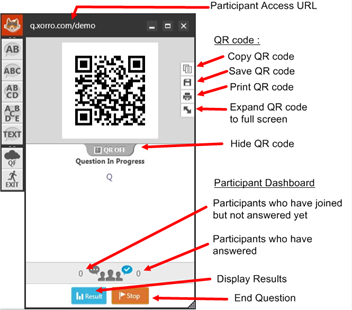 "Q-Launcher enables you to ask instant questions in session, without deviating from your slide show or other presentation context." In the next form (2): if you have prepared an activity, you can “import” this into the session now. You can also select a group (class, or course) here if these have already been set up. You can choose who can access your session and how they are to be identified, if your participants and / or groups have been set up ahead of time. If you have not set up your participants and groups, don’t worry: this won’t stop you from having a great and fun session! Just accept the defaults, and press "Start Activity". Xorro's Q-Launcher toolbar now appears (3). Click on the fox to "collapse" this toolbar to a floating tile, which you can locate wherever is convenient on your screen. Notice that the Q-Launcher remains floating above your presentation unless minimised. Your audience can join your session from this point onwards, by browsing to your Facilitator URL. Of course, they won't see any questions until you ask them! Start up your slide show, video or other presentation media and use these just as you would normally. The Q-Launcher tile will float over the top of these so you can access it at any time, just by clicking the Fox. If you want your audience to offer up text responses, press the button marked "TXT". Multiple responses are permitted. You can also ask for numeric responses by using the toggle at the edge of the TXT button. If you want your participants to choose and click on a location in an image on your screen, use the "IMG" button. Pressing one of these buttons on the Q-Launcher toolbar sends a response form to the audience devices, and launches the Response Panel (4), ready to display audience responses when you are ready. Behind the scenes, Q-Launcher also takes a snapshot of your screen at this point, and prepares to save this in association with your audience responses, for your future reference. You can choose to enable, or disable this feature. 4. Response Panel: appears on pressing any of the Instant Question buttons from the Q-Launcher Toolbar. Audience is answering your question. 5. Participants Toolbar: Displays participants and their response status. Your audience answers: Your audience might already have joined your session by directing their browsers to your Facilitator URL. In case they haven't, get them to do so now. The URL is displayed at the top of the Q-Launcher Response Panel. A QR code below this will help those in the audience primed to use a QR scanner, to reach this URL instantly (you can expand this QR code to fill the display, or copy or save it, perhaps emailing this to participants ahead of time). On participants' screens, your response form appears so they can enter text or select an option. Because this is an "instant" question, ie one you have not prepared, no question text is sent to the audience: Q-Launcher is relying on your verbally asking this, or perhaps including it in your slide so that the audience can see it as well. You can see how many participants have answered the question, and how many have joined your session but have not yet answered. By clicking on the Participants icon, the Participant toolbar will appear (5) displaying the names (or aliases) of participants who have not yet answered. 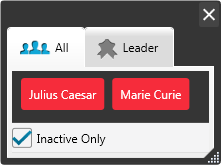 Un-check the "Inactive only" box to display all participants and their current “answered” status. When you’re ready, you can display the audience feedback ("Results") to the group if you wish (6). You can choose whether to allow the audience to continue to send in answers after you hav shared the Results (as you can “stop” the question at any time). Receiving Text Responses: If you've asked an open text response question, responses appear in the Response pane as a string of text entries (6-B). You can decide whether to display names of contributors, or keep the activity anonymous (Xorro-Q will remember your preference for next time). If a participant send up an inappropriate response, you can always remove it through a right-click – and you can at the same time, choose to “mute” the offender! (meaning that those persons' future contributions, while stored in your Results, will not be displayed to the audience again until you have un-muted them). 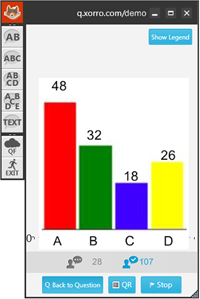 Hint: Often, facilitators choose to display text Results while leaving the question open to further answers; this stimulates new idea generation and learning from other participants. BONUS ACTIVITY: Try drag-and-dropping these responses into another other context, such as a Word document or a whiteboarding tool (eg Xorro Workbook) to organise ideas, annotate, or mindmap. You might then ask the audience to follow up on such a collection, by voting on the selected contributions. Wordcloud: If you select to display the results in a Wordcloud, this can be set to a full screen view. Key words are automatically sized and organised as they arrive. Moving on: You can “stop” the question at any time by pressing "Stop"; this stops receiving responses from the audience. You can ask another question instantly, by pressing any of the Instant Question buttons on the Q-Launcher toolbar (this stops any currently running questions, and starts a new question). Remember you can minimise or collapse the toolbar by pressing the Fox icon at the top left. At the end of the session, either press the close button on the top right of the Results Panel, or press "Exit" on the Q-Launcher toolbar. This will prompt a pop-up asking if you want to download (“export”) the Results as a CSV file. Choosing "Not Now" means just that, you can always go to your QF site an access the same data and download it later if you wish. Coming up...: In the 3rd "Bite" we'll be explaining how you can set up your activities in advance of sessions. You'll be using your QF site to prepare both Real Time and Self Paced Activities, add questions to activities, and organise questions into batches. You'll be able to then open these activities using your Q-Launcher in class... or if you prefer, you can also just run them from the QF site. Click here to read ahead to "Preparing Activities".